One of my favorite new things from the 2016-2017 Stampin’ Up! catalog is the set of Layering Ovals Framelits. I have been wanting something like this for years!!!! So I’m super excited to share with you that these framelits are on sale until next Wednesday! If they have been on your wish list, order them now and save 25%! You’ll notice that I used 3 different sizes of ovals for these 3 cards. The plain ovals layer with the scallop ovals beautifully and the choice of oval sizes in this set is fantastic! There are actually 8 plain oval dies and 7 scallop oval dies in the set. 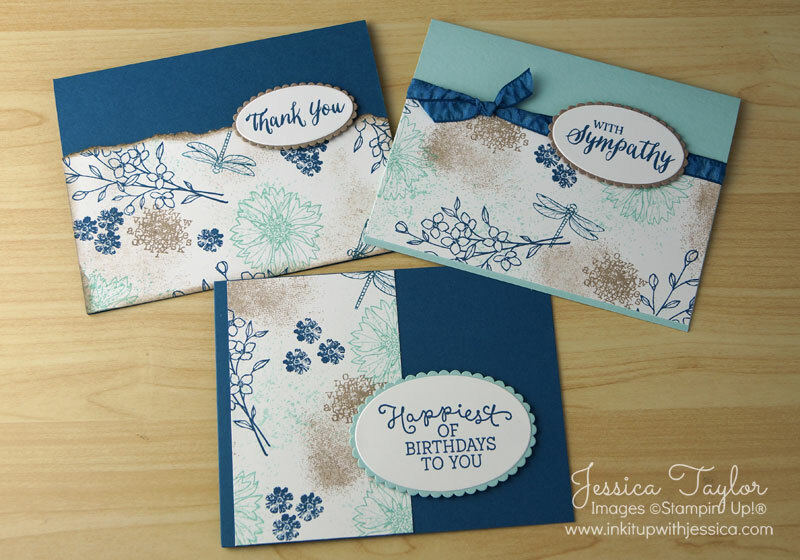 Stamp your greeting or image first and then hold the oval dies over them to select the size you want. On the dies, it’s the inside ring that will do the cutting. Sometimes you want a little space around your image and sometimes you want a lot. Play around until you get the look you like! I love my Magnetic Platform. I was discussing this with some other stampers recently and it was funny because it seems we either don’t use this at all or we use it ALL the time! I’m of the “use it all the time” camp and if anything ever happened to mine I would immediately purchase another one. Just like my Stamp-a-ma-jig. What’s so great about the Magnetic Platform? It holds your dies in place around your stamped image. If you don’t have a Magnetic Platform you can also use a post-it note or washi tape to make sure your oval stays on your card stock where you want it to. Cut your plain oval and then hold it over the scallop oval dies until you find the right fit. Again, remember it’s the inside of the die that does the cutting. Also, cutting out scallop ovals is a great way to use up some of your solid color paper scraps. Make sure you have good lighting. It’s easier to tape your oval layers together and keep them straight with an even border all the way around. If you have a Big Shot or other die-cutting machine, go ahead and order the Layering Ovals Framelits now and save 25%. You won’t be disappointed!